Looking for Amazon Web Services promo codes and coupons? #MasterTheWeb and save money today with our exclusive The Webmaster offers. 50 GB of storage on Amazons' Content Delivery Network. We have summarized all the services falling within each of these two types, along with any restrictions \ limits in the next two sections of this article below. These instructions will show you how to sign up with AWS, and check that you are eligible for free services. Visit Amazon Web Services by clicking here and click “Create a Free Account”. Visit Amazon Web Services © The Webmaster. 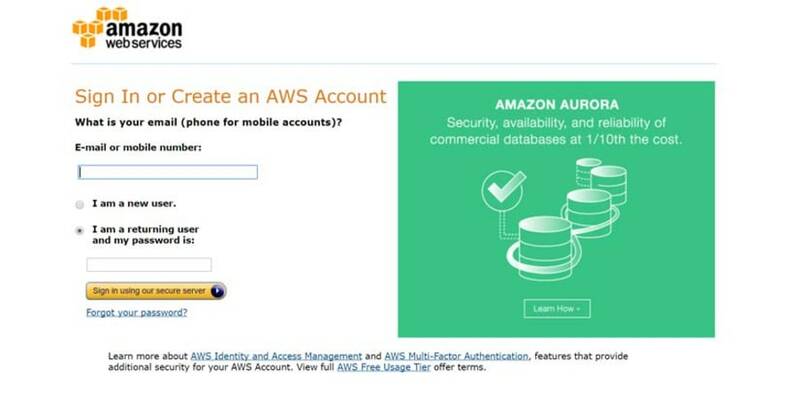 Click ‘Create a new AWS account’ to go to the new AWS account creation screen. After clicking this, you will be taken to a screen where you can actually Create an AWS Account (this intervening screen seems to be a little pointless). You will need to sign up as a brand new user to get this offer. Enter your email and select 'I am a new user.' © The Webmaster. Enter your name, email, and password that you want to use for your new account. Enter login credentials © The Webmaster. Next, you will need to enter your Name, Address, and telephone number. 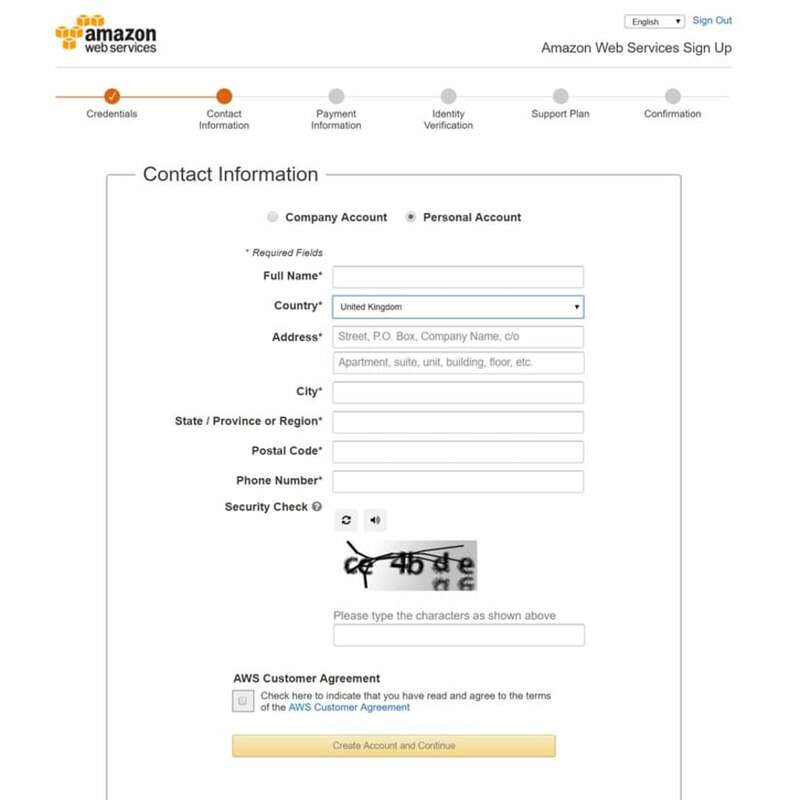 You will also need to confirm your accceptance of the AWS customer agreement. Enter Contact Information © The Webmaster. 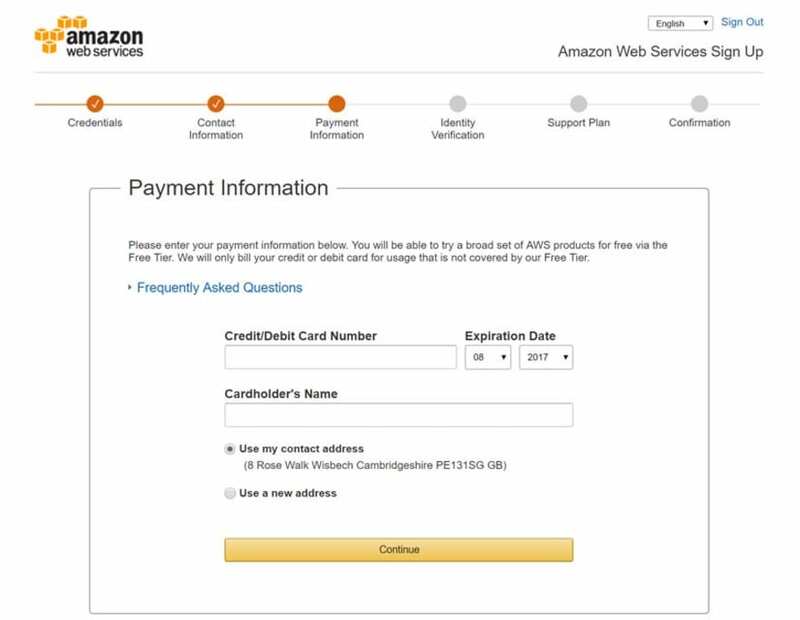 While you will qualify for a free 12 month trial, Amazon still requires you to enter billing information (in case you exceed your alloted allowances and for identity verification.) They will charge your card $1 to verify it, but they do not actually take the money (i.e. it may show as a pending charge in your account for a week or two before you can use it again.). 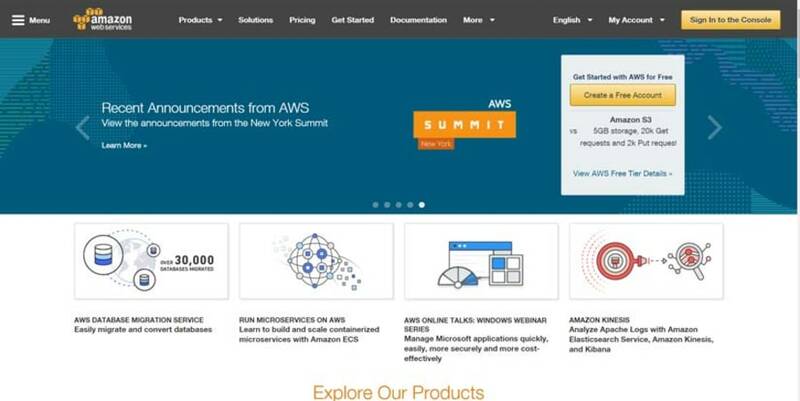 You will be able to try a broad set of AWS products for free via the Free Tier. We will only bill your credit or debit card for usage that is not covered by our Free Tier. Enter Payment Information © The Webmaster. Amazon will confirm your identify via phone and ask you to type the on-screen pin into your phones keypad. After the process has completed successfully, choose Continue to select your Support Plan. The final stage is to choose your support plan. Choose “Basic” for their free AWS Support Plan. Amazon Chime is a modern unified communications service that works across all devices to provide online meetings, video conferencing, calls, chat, and content sharing. You can use CloudWatch to monitor your AWS cloud resources and its applications. You can configure alarms as well as trigger processes to automatically react to certain changes in resources in order to ensure your applications run smoothly. 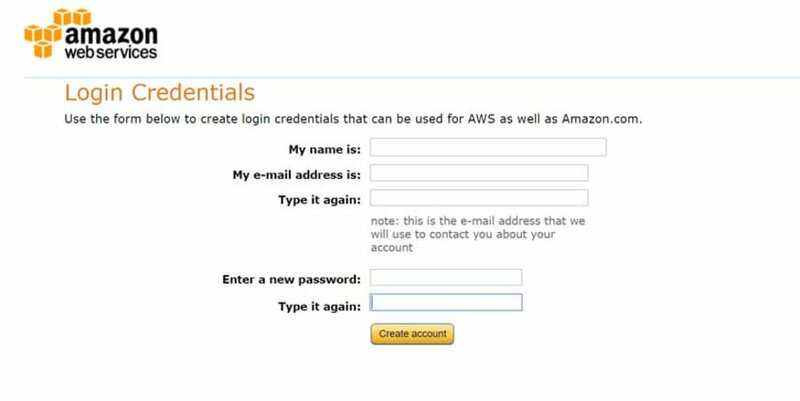 Amazon Cognito allows you to easily provide user authentication for you mobile and web applications. You can use your own system, or integrate with social providers such as Facebook, Twitter, or Amazon. Glacier is Amazons solution for archiving data and long-term cloud storage. Low-priced solution. 10 GB of Amazon Glacier data retrievals per month for free. Applies to standard retrievals only. Macie is a security service that utilizes machine learning to automatically discover, classify, and protect data stored in Amazon Web Services. Up to 1 GB of data processed by Macie. Measure app usage and revenue by tracking all the key trends you would expect from any web analytics program. Cost-effective email service in the Cloud, that can be integrated with your programs via their Amazon SES API in order to send email via third-party applications already in use, such as ticketing systems. 62,000 Outbound Messages per month when sent via Amazon EC2 or AWS Elastic Beanstalk. Fast, flexible, fully managed push messaging service for mobile users to iOS, Android, Fire OS, Windows and Baidu-based devices. It can also send push notifications to MacOS desktops and VoIP apps on iOS, emails and SMS messages to over 200 countries. A fully managed message queuing service that will store messages as they travel between computers in order to ensure it can work at scale without message loss. Task coordination and state management service for Cloud applications so developers can build, run and scale background jobs that have parallel or sequential steps. Fully managed build service that builds and tests code in the cloud. It scales continuously, and can process multiple builds concurrently for increased performance. Use pre-packaged environments, or build your own. Highly scalable, managed source control service that allows companies to host their Git repositories securely. Continuous integration and delivery service for application and infrastructure updates. It will build, test and deploy your code on every new release. Enables you to migrate databases to AWS while the source database remains operational throughout, significantly reducing downtime. Test your iOS, Android and FireOS apps on real devices in the AWS cloud. You can view screenshots, video, logs and other performance data in order to troubleshoot or optimize issues. Simple extract, transfer, and load (ETL) service. AWS Glue generates Python code that is customizable, reusable, and portable. Once your ETL job is ready, you can schedule it to run on AWS Glue's fully managed, scale-out Spark environment. AWS Key Management Service makes it easy to create and manage the encryption keys used to encrypt your data. It also links with AWS CloudTrail to ensure compliance with any regulations or compliance requirements. A service that lets you run code without provisioning or managing services. Lambda will run and scale your code on demand. You can also trigger code from other AWS services, or direct from web or mobile apps. AWS Step Functions allow you to easily coordinate distributed applications and microservices using visual workflows. It includes blueprints for commonly used workflows enabling you to build applications in minutes. A Hybrid cloud storage service that allows your on-premises applications to integrate with AWS storage in the cloud. Great for backups, archiving, disaster recovery, cloud bursting, storage tiering, and migration. X-Ray helps you analyze and debug production and distributed applications. Streamlines identifying and troubleshooting issues with your application. Fast and flexible NoSQL database that allows you to create consistent, single-digit ms latency at any scale. Great for mobile, web, gaming, ad tech and more. Enough to handle up to 200M requests per month. Amazon API Gateway is a scalable solution that makes it easy for developers to create, publish, maintain, monitor, and secure APIs. Build flexible cloud-native directories that can scale with hierarchical data along multiple dimensions. Scale to hundreds of millions of objects, with full schema support. A high performance Content Delivery Network that distributes content to end users with low latency and high data transfer speeds. Amazon Connect is a cloud-based contact center that scales to support any size business. Used by Amazon customer service themselves. Amazon Elastic Compute Cloud (EC2) provides resizable compute capacity in the Cloud. Allows easy scaling of capacity on demand. A fully managed Docker container registry service allowing you to store, retrieve and deploy Docker images quickly on demand. Amazon Elastic File System is a easy to use, scalable file storage service for Amazon EC2 instances in the Cloud. Storage capacity will shrink and grow (elastic) automatically as add or remove files ensuring scalability on demand. Amazon Elastic Block Store (Amazon EBS) provides persistent, durable, low-latency block-level storage volumes for EC2 instances. For data protection and high availability each instance is automatically replicated. EBS can be scaled up and down in minutes. A cost effective and scalable solution enabling developers to transcode media files in the cloud. Amazon ElastiCache allows you to deploy, manage and scale in-memory cache or data store in the cloud using either Redis, or Memcached. This significantly improves the performance of web applications. This is a fully managed Elastisearch service that offers APIs and integrations with Kibana, Logstash and AWS services. Log analytics, full text search, application monitoring and more. Deploy, operate, and scale dedicated game servers for session-based multiplayer games. Allows easier management of infrastructure, with easy scalability, DDoS protection while only paying for what you actually use. Build conversational interfaces utilizing deep learning and automatic speech recognition. Contains the same deep learning technologies that power Amazon Alexa. Automatically scales, so only pay for the resources you need. Allows you to build Voice and Chat Text Chatbots. Send messages using including Email, Text Messages (SMS), and Mobile Push Notifications. There are no upfront or monthly costs, and you only pay for the number of users targeted, messages sent and application events collected. Easily scales. Allows you to turn text into lifelike speech. Uses advanced deep learning to synthesize speech that sounds like a human voice, which can speak multiple languages. Amazon Relation Database Service (RDS) allows you to setup and manage a Relational Database Service for MySQL, PostgreSQL, MariaDB, Oracle BYOL, or SQL Server. This is an image analysis service utilizing deep learning-based image recognition. You can easily detect objects, scenes, faces and even recognize celebrities or inappropriate content in images. Using their API you can add sophisticated search and image classification to your applications. Amazon Simple Storage Services (Amazon S3) is built to enable secure, durable and scalable storage from web sites, mobile apps and other applications. This enables you to process and move data between different AWS compute and storage services, as well as local data. You can create complex data processing workloads that are reliable, repeatable and highly available. Run local compute, messaging, data caching, and sync capabilities for connected devices securely. Easily connect different types of devices with the cloud and each other. AWS Internet of Things is a platform that allows connected devices to easily and securely interact with cloud applications and other devices. It can support billions of devices and trillions of messages, processing and routing them securely. Provides a fully managed Chef server and other tools that automate continuous deployment, testing for compliance and security, and a user interface providing status information. AWS Trusted Advisor analyzes your AWS environment and provides best practice recommendations in four categories: Cost Optimization, Performance, Security and Fault tolerance. Automatically distributes traffic across multiple EC2 instances. Features high availability, automatic scaling and security. Are there any restrictions on the Free Tier elligibility? The free tier offers are available only to new Amazon Web Services customers, and only for 12 months. On expiry, or if usage exceeds the allotted allowances you will be charged at the pay-as-you-go rates. Your account must have a valid debit \ credit card attached. If you have not used the AWS resources for the previous 3 months, Amazon may reclaim those resources upon providing 30 days notice. You may claim the Free credits any time within 1 year of signing up to AWS. A full list of restrictions can be found here. Is the free trial limited by region? Yes. While the Amazon AWS Free Tier applies across all but the China region. If I don't use the allowance for a particular month does it roll over, or expire? Any unused usage amount will expire on the 1st day of each month, and does not roll over.